For the best Maytag brand has to offer, this high capacity dryer is packed with features that make light work of heavy loads. This model boasts a stout 8.8 cu. ft. capacity that's made to move mountains of laundry, and the PowerDry cycle, which gets your toughest loads dried every time. Plus, smart features give this dryer brains to match its brawn. Moisture sensors mean you can count on it to get clothes the right amount of dry, while the extra interior fin keeps clothes moving in more random tumbling patterns. You'll get less balling and tangling, and more compliments. And to top it off, this dryer is designed, engineered and assembled in the U.S.A., with a 10-year limited parts warranty. Unless explicitly stated otherwise, all washers and dryers are sold individually, not as sets, and all accessories such as pedestals and stacking kits are sold separately. Bring rugged durability and commercial-grade washer performance to your laundry room. Delivered straight from the Maytag. commercial washer and dryer assembly lines, this washer features a robust build, including a dual action agitator and stainless steel wash basket, powered by a 1/2 horsepower washing machine motor. These components are encased within thick, galvanized steel panelling engineered to take a beating and resist corrosion. Four Deep Water Wash cycles, including the PowerWash. cycle, use maximum water levels to drench loads for thorough cleaning. Tough and dependable year after year, Maytag confidently backs this washer with our best home appliance warranty for in-home, commercial laundry equipment. Some stains dissolve best in hot water. Others in cold. 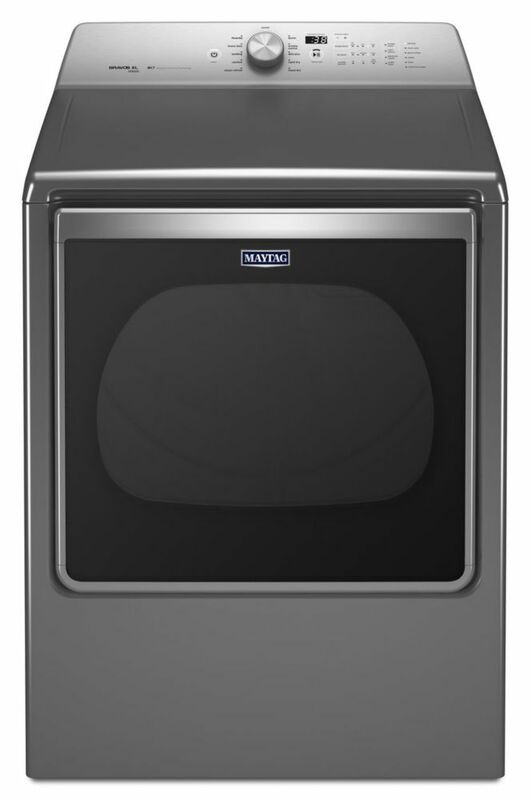 With the push of a button, Maytag fights both in a single load. The Extra Power button boosts stain-fighting performance on any wash cycle with an industry-exclusive, dual temperature wash.
Get the heavy duty washing machine that delivers the Most Powerful Cleaning in the industry driven by the Heavy Duty cycle with Extra Power button. The Extra Power button boosts stain-fighting performance on any wash cycle with a dual-temperature wash. The Quick Wash cycle cleans small, lightly soiled loads in 15 minutes. And with the 16-Hour Fresh Hold® option, Maytag helps keep clean clothes smelling fresh for up to 16 hours after wash cycles end. Bring rugged durability and commercial-grade dryer performance to your laundry room. Delivered straight from the Maytag. commercial washer and dryer assembly lines, this dryer features a robust build, including a premium motor and 7.4 cu. ft. capacity drum. These components are encased within thick, galvanized steel paneling engineered to take a beating and resist corrosion. Tough and dependable year after year, Maytag confidently backs this dryer with our best home appliance warranty for in-home, commercial laundry equipment. 8.8 cu. ft. Extra-Large Capacity Gas Dryer with Advanced Moisture Sensing in Chrome Shadow For the best Maytag brand has to offer, this high capacity dryer is packed with features that make light work of heavy loads. This model boasts a stout 8.8 cu. ft. capacity that's made to move mountains of laundry, and the PowerDry cycle, which gets your toughest loads dried every time. Plus, smart features give this dryer brains to match its brawn. Moisture sensors mean you can count on it to get clothes the right amount of dry, while the extra interior fin keeps clothes moving in more random tumbling patterns. You'll get less balling and tangling, and more compliments. And to top it off, this dryer is designed, engineered and assembled in the U.S.A., with a 10-year limited parts warranty. Unless explicitly stated otherwise, all washers and dryers are sold individually, not as sets, and all accessories such as pedestals and stacking kits are sold separately.